Mercury is the innermost and smallest planet in the solar system. It has no known satellites. The exploration of Mercury has posed questions concerning fundamental issues of its origin and, therefore, the origin and evolution of all the terrestrial planets. The data obtained by Mariner 10 on its three flybys of Mercury on March 29 and September 21, 1974, and on March 16, 1975, remain our best source of detailed information on this planet. However, recent ground-based observations have provided important new information on the topography, radar, and microwave characteristics of its surface; discovered new constituents in its atmosphere; and helped constrain its surface composition. The MESSENGER spacecraft arrived at Mercury in March 2011 after a 6 year travelis currently on its way to Mercury and will begin orbiting the planet in March 2011. The name MESSENGER is an acronym for MErcury, Surface, Space ENvironment, GEochemistry, and Ranging. To the ancients, Mercury was the messenger of the gods. 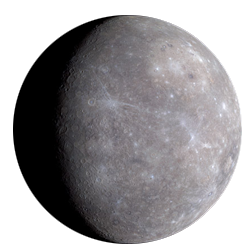 Mercury is often compared with the Moon because it superficially resembles that satellite. However, major differences set Mercury apart from the Moon and, for that matter, all other planets and satellites in the solar system. Mariner 10 imaged only about 45% of the surface at an average resolution of about 1 km, and less than 1% at resolutions between about 100 to 500 m (Fig. 1). This cover age and resolution is comparable to telescopic Earth-based coverage and resolution of the Moon before the advent of space flight. However, unlike the Moon in the early 1960s, only about 25% of the surface was imaged at Sun angles low enough to allow adequate terrain analyses. As a consequence, there are still many uncertainties and questions concerning the history and evolution of Mercury. Mariner 10 also discovered a magnetic field, measured the temperature, and derived the physical properties of its surface. On Mercury, the prime meridian (0◦) was chosen to coincide with the subsolar point during the first perihelion passage after January 1, 1950. Longitudes are measured from 0◦ to 360◦, increasing to the west. Craters are mostly named after famous authors, artists, and musicians such as Dickens, Michelangelo, and Beethoven, whereas valleys are named for prominent radio observatories such as Arecibo and Goldstone. Scarps are named for ships as sociated with exploration and scientific research such as Discovery and Victoria. Plains are named for the planet Mercury in various languages such as Odin (Scandinavian) and Tir (Germanic). Borealis Planitia (Northern Plains) and Caloris Planitia (Plains of Heat) are exceptions. The most prominent feature viewed by Mariner 10 is named the Caloris Basin (Basin of Heat) because it nearly coincides with one of the “hot poles” of Mercury. Mercury`s diameter is only 4878 km, but it has a relatively large mass of 3.301 × 1023 kg. Because of its large mass in relation to its volume, Mercury has an exceptionally high mean density of 5440 kg/m3, second only to the density of the Earth (5520 kg/m3). The manner in which it reflects light (its photometric properties) is very similar to the way light is reflected by the Moon. The brightness (albedo) of certain terrains is greater than comparable terrains on the Moon. Mercury is covered with a regolith consisting of fragmental material derived from the impact of meteoroids over billions of years. Mercury`s surface is heavily cratered with smooth plains that fill and surround large impact basins. Long lobate scarps traverse the surface for hundreds of kilometers, and large expanses of intercrater plains (the most extensive terrain type) fill regions between clusters of craters in the highlands. Also a peculiar terrain consisting of a jumble of large blocks and linear troughs occurs antipodal to the Caloris Basin. Mercury has the most eccentric (0.205) and inclined (7◦) orbit of any planet. However, over periods of a few million years, its eccentricity may vary from about 0.1 to 0.28 and its inclination from about 0◦ to 11◦. Its average distance from the Sun is 0.3871 AU (5.79 × 107 km). Because of its large eccentricity, however, the distance varies from 0.3075 AU (4.6 × 107 km) at perihelion to 0.4667 AU (6.98 × 107 km) at aphelion. As a consequence, Mercury`s orbital velocity averages 47.6 km/s but varies from 56.6 km/s at perihelion to 38.7 km/s at aphelion. At perihelion the Sun`s apparent diameter is over three times larger than its apparent diameter as seen from Earth. Mercury`s rotation period is 58.646 Earth days, and its orbital period is 87.969 Earth days. Therefore, it has a unique 3:2 resonance between its rotational and orbital periods: It makes exactly three rotations on its axis for every two orbits around the Sun. This resonance was apparently acquired over time as the natural consequence of the dissipative processes of tidal friction and the relative motion between a solid mantle and a liquid core. As a consequence of this resonance, a solar day (sunrise to sunrise) lasts two Mercurian years or 176 Earth days. The obliquity of Mercury is close to 0◦; therefore, it does not experience seasons as do Earth and Mars. Consequently, the polar regions never receive the direct rays of sunlight and are always frigid compared to torrid sunlit equatorial regions. Another effect of the 3:2 resonance between the rotational and orbital periods is that the same hemisphere always faces the Sun at alternate perihelion passages. This happens because the hemisphere facing the Sun at one perihelion will rotate one and a half times by the next perihelion, so that it faces away from the Sun; after another orbit, it rotates another one-and-a half times so that it directly faces the Sun again. Because the subsolar points of the 0◦ and 180◦ longitudes occur at perihelion they are called hot poles. The subsolar points at the 90◦ and 270◦ longitudes are called warm poles because they occur at aphelion. Yet another consequence of the 3:2 resonance and the large eccentricity is that an observer on Mercury (depending on location) would witness a double sunrise, or a double sunset, or the Sun would backtrack in the sky at noon during perihelion passage. Near perihelion Mercury`s orbital velocity is so great compared to its rotation rate that it over comes the Sun`s apparent motion in the sky as viewed from Mercury. Although Mercury is closest to the Sun, it is not the hottest planet. The surface of Venus is hotter because of its atmospheric greenhouse effect. However, Mercury experiences the greatest range (day to night) in surface temperatures (650◦ C = 1170◦ F) of any planet or satellite in the solar system because of its close proximity to the Sun, its peculiar 3:2 spin orbit coupling, its long solar day, and its lack of an insulating atmosphere. Its maximum surface temperature is about 467◦ C (873◦ F) at perihelion on the equator; hot enough to melt zinc. At night just before dawn, the surface temperature plunges to about −183◦ C (−297◦ F). Although Mercury has an atmosphere, it is extremely tenuous with a surface pressure a trillion times less than Earth`s. The number density of atoms at the surface is only 105 atoms cm−3 for the known constituents (Table 1). It is, therefore, an exosphere where atoms rarely collide; their interaction is primarily with the surface. Mariner 10`s ultraviolet spectrometer identified hydrogen, helium, and oxygen and set upper limits on the abundance of argon, neon, and carbon in the exosphere. The hydrogen and helium are probably derived largely from the solar wind, although a portion of the helium may be of radiogenic origin, and some hydrogen could result from the photodissociation of H20. The interaction of high-energy particles with surface materials may liberate enough oxygen to be its principal source, but breakdown of water vapor molecules by sunlight could also be a possible source. In 1985 – 1986, Earth-based telescopic observations detected sodium and potassium in the exosphere, and subsequent observations have detected calcium. Sodium and potassium are also found in the Moon`s exosphere. Both sodium and potassium have highly variable abundances 104 – 105 Na atoms/cm3 and 102 – 104 K atoms/cm3 near the surface on timescales of hours to years. Their abundances also vary between day and night by a factor of about 5, the dayside being greater. Often bright spots of emission are seen at high northern latitudes or over the Caloris Basin. The temperature of the gas is about 500 K, but a hotter more extended Na coma sometimes exists. Observed variations in the abundances of these elements are consistent with the photoionization timescale of 120 minutes for sodium and ±90 minutes for potassium. Photoionization of the gas will result in the exospheric ions being accelerated by the electric field in the planetary magnetosphere. Ions created on one hemisphere will be accelerated toward the planetary surface and recycled, but ions on the opposite hemisphere will be ejected away and lost. The total loss rate of sodium atoms is about 1.3 × 1022 atoms per second, so the atoms must be continuously supplied by the surface. The total fraction of ions lost to space from the planet is at least 30%. The atmosphere, therefore, is transient and exists in a steady state between its surface sources and sinks. Although both sodium and potassium are probably derived from the surface of Mercury, the mechanism by which they are supplied is not well understood. The sodium and potassium in the Mercurian exosphere could be released from sodium- and potassium-bearing minerals by their interaction with solar radiation, or impact vaporization of micrometeoroid material. Both sodium and potassium show day-to-day changes in their global distribution. If surface minerals are important sources for the exosphere, then a possible explanation is that their sodium/potassium ratio varies with location on Mercury. A possible explanation for some of the K and Na variations is that Na and K ion implantation into regolith grains during the long Mercurian night (88 Earth days), and subsequent diffusion to the exosphere when the enriched surface rotates into the intense sunlight. At least one area of enhanced exospheric potassium emission apparently coincides with the Caloris Basin whose floor is highly fractured. This exospheric enhancement has been attributed to increased diffusion and degassing in the surface and subsurface through fractures on the basin floor, although other explanations may be possible. Thermal infrared measurements from Mariner 10 indicate that the surface is a good insulator and, therefore, consists of a porous cover of fine-grained regolith. Earth-based microwave measurements indicate that this layer is a few centimeters thick and is underlain by a highly compact region extending to a depth of several meters. Mercury`s heavily cratered terrain contains large areas of gently rolling intercrater plains, the major terrain type on the planet. Mercury`s surface is also traversed by a unique system of contractional thrust faults called lobate scarps. The largest well-preserved structure viewed by Mariner 10 is the Caloris impact basin some 1300 km in diameter. Antipodal to this basin is a large region of broken up terrain called the hilly and lineated terrain, probably caused by focused seismic waves from the Caloris impact. Other relatively minor units have been identified, such as ejecta deposits exterior to the Caloris and other basins. The heavily cratered uplands probably record the period of late heavy meteoroid bombardment that ended about 3.8 billion years ago on the Moon, and presumably at about the same time on Mercury. This period of late heavy bombardment occurred throughout the inner solar system and is also recorded by the heavily cratered regions on the Moon and Mars. Based on chemical evidence from Apollo samples from the Moon, the bombardment may have been catastrophic lasting only about 100 million years or less. It appears to have peaked about 3.9 billion years ago. In the heavily cratered terrain on Mercury, there is an increasing paucity of craters with decreasing crater diameter relative to heavily cratered terrain on the Moon. This paucity of craters is probably due to obliteration of the smaller craters by emplacement of intercrater plains during the period of late heavy bombardment. Below a diameter of about 20 km, the abundance of craters increases sharply. These craters may represent secondary impact craters from large craters or basins. The crater population superimposed on the smooth plains within and surrounding the Caloris Basin has a size distribution intermediate between the heavily cratered and lightly cratered plains. This suggests that unlike the lunar maria the Caloris smooth plains formed near the end of late heavy bombardment. Fresh impact craters on Mercury exhibit similar morphologies as those on the other terrestrial planets. Small craters are bowl-shaped, but with increasing size they develop central peaks, flat floors, and terraces on their inner walls. The transition from simple (bowl-shaped) to complex (central peak and terraces) craters is about 10 km. At diameters between ∼130 and 310 km Mercurian craters have an interior concentric ring, and at diameters larger than about 300 km they may have multiple inner rings. The freshest craters have extensive ray systems, some of which extend for distances over 1000 km. For a given rim diameter, the radial extent of Mercurian continuous ejecta is uniformly smaller by a factor of about 0.65 than that for the Moon. Furthermore, the maximum density of secondary impact craters occurs closer to the crater rim than for similarly sized lunar craters: The maximum density occurs at about 1.5 crater radii from the rim of Mercurian primaries, whereas the maximum density occurs at about 2 – 2.5 crater radii on the Moon. All of these differences are probably due to the larger surface gravity of Mercury (3.70 m/s2) compared to the Moon (1.62 m/s2). Twenty-two multiring basins have been recognized on the part of Mercury viewed by Mariner 10. However, high resolution radar images of the side not viewed by Mariner 10 show several large circular features about 1000 km in diameter that may be impact basins. Based on the pattern and extent of grabens on the floor of Caloris, it is estimated that Mercury`s lithosphere under Caloris was thicker (>100 km) than the Moon`s (between 25 and >75 km depending on location) at the end of late heavy bombardment. The 1300-km-diameter Caloris impact basin is the largest well-preserved impact structure, although the much more degraded Borealis Basin is larger (1530 km). The floor structure of the Caloris Basin is like no other basin floor structure in the solar system. It consists of closely spaced ridges and troughs arranged in both a concentric and radial pattern. The ridges are probably due to contraction, while the troughs are probably extensional grabens that postdate the ridges. The fractures get progres sively deeper and wider toward the center of the basin. Near the edge of the basin there are very few fractures. This pattern may have been caused by subsidence and subsequent uplift of the basin floor. Mercury`s two plains units have been interpreted as either impact basin ejecta or as lava plains. The older intercrater plains are the most extensive terrain on Mercury. They both partially fill and are superimposed by craters in the heavily cratered uplands. Furthermore, they have probably been responsible for obliterating a significant number of craters as evidenced by the paucity of craters less than about 40 km diameter compared to the highlands of the Moon. Therefore, intercrater plains were emplaced over a range of ages contemporaneous with the period of late heavy bombardment. There are no definitive features diagnostic of their origin. Because intercrater plains were emplaced during the period of late heavy bombardment, they are probably extensively fragmented and do not retain any signature of their original surface morphology. Although no landforms diagnostic of volcanic activity have been discovered, there are also no obvious source basins to provide ballistically emplaced ejecta. The global distribution of intercrater plains and the lack of source basins for ejecta deposits are indirect evidence for a volcanic origin. Additional evidence for a volcanic origin is recent Mariner 10 enhanced color images showing color boundaries that coincide with geologic unit boundaries of some intercrater plains. If intercrater plains are volcanic, then they are probably lava flows erupted from fissures early in Mercurian history. Intercrater plains are probably ≥ 3.9 billions years old. The younger smooth plains cover almost 40% of the total area imaged by Mariner 10. About 90% of the regional exposures of smooth plains are associated with large impact basins. They also fill smaller basins and large craters. The largest occurrence of smooth plains fill and surround the Caloris Basin, and occupy a large circular area in the north polar region that is probably an old impact basin (Borealis Basin). They are similar in morphology and mode of occurrence to the lunar maria. Craters within the Borealis, Goethe, Tolstoy, and other basins have been flooded by smooth plains. This indicates the plains are younger than the basins they occupy. This is supported by the fact that the density of craters superimposed on the smooth plains that surround the Caloris Basin is substantially less than the density of craters superimposed on the floors of all major basins including Caloris. Furthermore, several irregular rimless depressions that are probably of volcanic origin occur in smooth plains on the floors of the Caloris and the Tolstoy basins. The smooth plains` youth relative to the basins they occupy, their great areal extent, and other stratigraphic relationships suggest they are volcanic deposits erupted relatively late in Mercurian history. Mariner 10 enhanced color images show the boundary of smooth plains within the Tolstoy Basin is also a color boundary, further strengthening the volcanic interpretation for the smooth plains. Based on the shape and density of the size/frequency distribution of superimposed craters, the smooth plains probably formed near the end of late heavy bombardment. They may have an average age of about 3.8 billion years as indicated by crater densities. If so, they are, in general, older than the lava deposits that constitute the lunar maria. Three large radar-bright anomalies have been identified on the unimaged side of Mercury. They are designated as A (347◦W longitude, −34◦ latitude), B (343◦W longitude, 58◦ longitude), and C (246◦W longitude, 11◦ N latitude). All features are relatively fresh impact craters with radar-bright ejecta blankets and/or rays similar to Kuiper crater (60 km diameter) on the imaged portion of Mercury. Feature A is 85 km in diameter with an extensive ray system and a rough radar-bright floor, consistent with a fresh impact crater. Feature B is 95 km diameter with radar-bright rays and a radar-dark floor. Unlike feature A, the radar-dark floor indicates it is smooth at the 12.6 cm wavelength of the image. Feature C is a fresh crater about 125 kilometers in diameter. Water-rich comets or asteroids responsible for one or more of these craters could be the source of the polar water-ice deposits. Directly opposite the Caloris Basin on the other side of Mercury (the antipodal point of Caloris) is the unusual hilly and lineated terrain that disrupts preexisting land forms, particularly crater rims. The hills are 5–10 km wide and about 0.1 – 1.8 km high. Linear depressions that are probably extensional fault troughs form a roughly orthogonal pattern. Geologic relationships suggest that the age of this terrain is the same as that of the Caloris Basin. Similar, but smaller, terrains occur at the antipodes of the Imbrium and Orientale impact basins on the Moon. The hilly and lineated terrain is thought to be the result of shock waves generated by the Caloris impact and focused at the antipodal region. Computer simulations of shock wave propagation indicate that focused shock waves from an impact of this size can cause vertical ground motions of about 1 km or more and tensile failure to depths of tens of kilometers below the antipode. Although the lunar Imbrium Basin (1400 km diameter) is larger than the Caloris Basin, the disrupted terrain at its antipode is much smaller than that at the Caloris antipode. The larger disrupted terrain on Mercury may be the result of enhanced shock wave focusing due to the large iron core. Little is known about the surface composition of Mercury. If the plains units (intercrater and smooth) are lava flows, then they must have been very fluid with viscosities similar to fluid flood basalts on the Moon, Mars, Venus, and Earth. The way in which light is reflected from the surface is very similar to that of the Moon. However, at comparable phase angles and wavelengths in the visible part of the spectrum, Mercury appears to have systematically higher albedos than the Moon. Mercurian albedos range from 0.09 to 0.36 at 5◦ phase angle. The higher albedos are usually associated with rayed craters. However, the highest albedo (0.36) on Mariner 10 images is not associated with a bright-rayed crater: It is a floor deposit in Tyagaraja Crater at 3◦N latitude and 149◦ longitude. The lunar highlands/mare albedo ratio is almost a factor of 2 on the Moon, but it is only a factor of 1.4 on Mercury. Furthermore, at ultraviolet wavelengths (58 – 166 nm) Mercury`s albedo is about 65% lower than the Moon`s at comparable wavelengths. These differences in albedo suggest that there are systematic differences in the surface composition between the two bodies. A recalibration and color ratioing of Mariner 10 images have been used to derive the FeO abundance, the opaque mineral content, and the soil maturity over the region viewed by Mariner 10. The probably volcanic smooth plains have a FeO content of < 6 weight percent that is similar to the rest of the planet imaged by Mariner 10. The surface of Mercury, therefore, may have a more homogeneous distribution of elements affecting color (e.g., more alkali plagioclase) than does the Moon. At least the smooth plains may be low iron or alkali basalts. Since the iron content of lavas is thought to be representative of their mantle source regions, it is estimated that Mercury`s mantle has about the same FeO content (< 6 weight percent) as the crust, indicating Mercury is highly reduced with most of the iron in the core. In contrast, the estimated FeO contents of the mantle of the bulk Moon is 11.4 %, of Venus and the Earth 8%, and of Mars ~18%. There are some low-albedo regions with spectral properties suggesting high opaque mineral areas. These have diffuse boundaries that may be associated with fractures. These areas could be more mafic volcanic pyroclastic deposits. The bright-rayed craters on Mercury have a very low opaque mineral index that may indicate the craters have excavated into an anothositic crust. Color ratios of lunar and Mercurian crater rays also suggest that the surface of Mercury is low in Ti4+, Fe2+, and metallic iron compared to the surface of the Moon. From spectroscopic measurements, the FeO content of Mercury`s surface is less than 3%. This is consistent with Mercury`s lower ultraviolet reflectivity and smaller albedo contrast. The FeO content is significantly less than many of the surfaces of the Moon and other terrestrial planets. Earth-based microwave and mid infrared observations also indicate that Mercury`s surface has less FeO plus TiO2, and at least as much feldspar as the lunar highlands. This has been interpreted as indicating that Mercury`s surface is largely devoid of basalt, but it could also mean that the basalts only have a low iron content or are fluid sodium-rich basalts. It has been suggested that eruption of highly differentiated basaltic magma may have produced alkaline lavas. On Earth there are low viscosity alkali basalts that could produce the type of volcanic morphology represented by Mercury`s plains. Mercury could be the only body in the inner solar system that has not experienced substantial high-iron basaltic volcanism and, therefore, may have undergone a crustal petrologic evolution different from other terrestrial planets. In summary, both Earth-based spectroscopic observations and calibrated Mariner 10 images indicate that the surface composition of Mercury has a varied composition with a wide range of SiO2 content. The FeO content appears to be between 1 and 3%. This is abnormally low compared to other terrestrial planets and the Moon. There is spectrographic evidence for the Mg-rich mineral pyroxene. The spectroscopic data are consistent with compositions ranging from low-iron basalts to anorthosites. We will have to await the MESSENGER mission data to discover the detailed composition of Mercury and its variation across the surface. No other planet or satellite in the solar system has a tectonic framework like Mercury`s. It consists of a system of contractional thrust faults called lobate scarps (Figs. 16 and 17). Individual scarps vary in length from < 20 to > 500 km and have heights from a few 100 m to about 3 km. They have a random spatial and azimuthal distribution over the imaged half of the planet and presumably occur on a global scale. Thus, at least in its latest history, Mercury was subjected to global contractional stresses. The only occurrences of features indicative of extensional stresses are localized fractures associated with the floor of the Caloris Basin and at its antipode, both of which are the direct or indirect result of the Caloris impact. No lobate scarps have been embayed by intercrater plains on the region viewed by Mariner 10, and they transect fresh as well as degraded craters. Few craters are superimposed on the scarps. Therefore, the system of thrust faults appears to postdate the formation of intercrater plains and to have been formed relatively late in Mercurian history. This tectonic framework was probably caused by crustal shortening resulting from a decrease in the planet radius due to cooling of the planet. The amount of radius decrease is estimated to have been anywhere between 0.5 and 2 km. Also there is apparently a system of structural lineaments consisting of ridges, troughs, and linear crater rims that have at least three preferred orientations trending in north east, northwest, and north–south directions. The Moon also shows a similar lineament system. The Mercurian system has been attributed to modifications of ancient linear crustal joints formed in response to stresses induced by tidal spin down. All thermal history models of planets depend on compositional assumptions, such as the abundance of uranium, thorium, and potassium in the planet. Since our knowledge of the composition of Mercury is so poor, these models can only provide a general idea of the thermal history for certain starting assumptions. Nevertheless, they are useful in providing insights into possible modes and consequences of thermal evolution. Starting from initially molten conditions for Mercury, thermal history models with from 0.2 to 5% sulfur in the core indicate that the total amount of planetary radius decrease due to cooling is from ∼6 to 10 km depending on the amount of sulfur (Fig. 18). About 6 km of this contraction is solely due to mantle cooling during about the first 700 million years before the start of inner core formation. The amount of radius decrease due to inner core formation alone is about 1 km for 5% sulfur and about 4 km for 0.2% sulfur. Thermal models suggest that inner core formation may have begun about 3 billion years ago, and, therefore, after the period of cataclysmic bombardment (Fig. 18). This would imply that the observed tectonic framework began at about the same time, and that smooth and intercrater plains were emplaced before inner core formation. Indeed, the geologic evidence indicates that at least the observed tectonic framework began to form relatively late in Mercury`s history; certainly after intercrater plains formation and possibly after smooth plains formation. However, under initially molten conditions, the thermal history models indicate that the lithosphere has always been in contraction. The surface record of the period of intense contraction caused by mantle cooling has probably been erased by the period of cataclysmic bombardment and intercrater plains formation that occurred from about 3.9 to 3.8 billion years ago. That would explain why there is no evidence for old compressive structures. If the upper value of a 2-km radius decrease, inferred from the thrust faults, was due solely to cooling and solid ification of the inner core, then the core sulfur abundance is probably 2–3%, and the present fluid outer core is about 500 or 600 km thick. If the lower value of a 0.5-km radius decrease is correct, then there must be more than 5% sulfur in the core, and the present fluid outer core would be over 1000 km thick. If the smooth and intercrater plains are volcanic flows, then they must have had some way to easily reach the surface to form such extensive deposits. Early lithospheric compressive stresses would make it difficult for lavas to reach the surface, but the lithosphere may have been relatively thin at this time (< 50 km). Large impacts would be expected to strongly fracture it, possibly providing egress for lavas to reach the surface and bury compressive structures. Mercury`s earliest history is very uncertain. If a portion of the mantle was stripped away, as invoked by most scenarios to explain its high mean density, then Mercury`s earliest recorded surface history began after core formation, and a possible mantle-stripping event (see Section 7). The earliest events are the formation of intercrater plains (≥3.9 billion years ago) during the period of late heavy bombardment. These plains may have been erupted through fractures caused by large impacts in a thin lithosphere. Near the end of late heavy bombardment, the Caloris Basin was formed by a large impact that caused the hilly and lineated terrain from seismic waves focused at the antipodal region. Further eruption of lava within and surrounding the Caloris and other large basins formed the smooth plains about 3.8 billion years ago. The system of trust faults formed after the intercrater plains, but how soon after is not known. If the observed thrust faults resulted only from core cooling, then they may have begun after smooth plains formation and resulted in a decrease in Mercury`s radius. As the core continued to cool and the lithosphere thickened, compressive stresses closed off the magma sources, and volcanism ceased near the end of late heavy bombardment. All of Mercury`s volcanic events probably took place very early in its history, perhaps during the first 700 to 800 million years. Today the planet may still be contracting as the present fluid outer core continues to cool. The origin of Mercury and how it acquired such a large fraction of iron compared to the other terrestrial planets is not well determined. Chemical condensation models for Mercury`s present position in the innermost part of the solar nebula, from which the solar system formed, cannot account for the large fraction of iron that must be present to explain its high density. Although these early models are probably inaccurate, revised models that take into account material supplied from feeding zones in more distant regions of the inner solar system only result in a mean uncompressed density of about 4200 kg/m3, rather than the observed 5300 kg/m3. Furthermore, at Mercury`s present distance, the models predict the almost complete absence of sulfur (100 parts per trillion FeS), which is apparently required to account for the presently molten outer core. Other volatile elements and compounds, such as water, should also be severely depleted (< 1 part per billion of hydrogen). Three hypotheses have been put forward to explain the discrepancy between the predicted and observed iron abundance. One (selective accretion) involves an enrichment of iron due to mechanical and dynamical accretion processes in the innermost part of the solar system; the other two (postaccretion vaporization and giant impact) invoke removal of a large fraction of the silicate mantle from a once larger proto-Mercury. In the selective accretion model, the differential response of iron and silicates to impact fragmentation and aerodynamic sorting leads to iron enrichment owing to the higher gas density and shorter dynamical timescales in the innermost part of the solar nebula. In this model, the removal process for silicates from Mercury`s present position is more effective than for iron, leading to iron enrichment. The postaccretion vaporization hypothesis proposes that intense bombardment by solar electromagnetic and corpuscular radiation in the earliest phases of the Sun`s evolution vaporized and drove off much of the silicate fraction of Mercury leaving the core intact. In the giant impact hypothesis, a planet-sized object impacts Mercury and essentially blasts away much of the planet`s silicate mantle leaving the core largely intact. Discriminating among these models is difficult, but may be possible from the chemical composition of the silicate mantle (Fig. 19). For the selective accretion model, Mercury`s silicate portion should contain about 3.6 – 4.5% alumina, about 1% alkalioxides (Na and K), and between 0.5 and 6% FeO. Postaccretion vaporization should lead to very severe depletion of alkali oxides (∼0%) and FeO (< 0.1%), and extreme enrichment of refractory oxides (∼40%). If a giant impact stripped away the crust and upper mantle late in accretion, then alkali oxides may be depleted (0.01 – 0.1%), with refractory oxides between ∼0.1 and 1% and FeO between 0.5 and 6%. Unfortunately our current knowledge of Mercury`s silicate composition is extremely poor, but near and mid-infrared spectroscopic measurements favor low FeO- and alkali-bearing feldspars. If the tenuous atmosphere of sodium and potassium is being out gassed from the interior, as suggested by some, then the postaccretion vaporization model may be unlikely. Deciding between the other two models is not possible with our current state of ignorance about the silicate composition. Since the selective accretion hypothesis requires Mercury to have formed near its present position, then sulfur should be nearly absent, unless the solar nebula temperatures in this region were considerably lower than predicted by the chemical equilibrium condensation model. Support for the giant impact hypothesis comes from three-dimensional computer simulations of terrestrial planet formation for several starting conditions. Since these simulations are by nature stochastic, a range of outcomes is possible. They suggest, however, that significant fractions of the terrestrial planets may have accreted from material formed in widely separated parts of the inner solar system. The simulations indicate that during its accretion Mercury may have experienced large excursions in its semimajor axis. These semimajor axis excursions may have ranged from as much as 0.4 – 1.4 AU due to energetic impacts during accretion (Fig. 20). Consequently, Mercury could have accumulated material originally formed over the entire terrestrial planet range of heliocentric distances. About half of Mercury`s mass could have accumulated at distances between about 0.8 and 1.2 AU (Fig. 21). If so, then Mercury may have acquired its sulfur from material that formed in regions of the solar nebula where sulfur was stable. Plausible models estimate FeS contents of 0.1 – 3%. However, the most extreme models of accretional mixing result in homogenizing the entire terrestrial planet region, contrary to the observed large systematic density differences. The simulations also indicate that byproducts of terrestrial planet formation are planet-sized objects up to three times the mass of Mars that become perturbed into eccentric orbits (mean e ∼0.15 or larger) and eventually collide with the terrestrial planets during their final stages of growth. The final growth and giant impacts occur within the first 50 million years of solar system history. Such large impacts may have resulted in certain unusual characteristics of the terrestrial planets, such as the slow retrograde rotation of Venus, the origin of the Moon, the martian crustal dichotomy, and Mercury`s large iron core. In computer simulations where proto-Mercury was 2.25 times the present mass of Mercury with an uncompressed density of about 4000 kg/m3, nearly central collisions of large projectiles with iron cores impacting at 20 km/s, or noncentral collisions at 35 km/s resulted in a large silicate loss and little iron loss (Fig. 22). In the former case, al though a large portion of Mercury`s iron core is lost, an equally large part of the impactor`s iron core is retained resulting in about the original core size. At Mercury`s present distance from the Sun, the ejected material reaccretes back onto Mercury if the fragment sizes of the ejected material are greater than a few centimeters. However, if the ejected material is in the vapor phase or fine-grained (≤1 cm), then it will be drawn into the Sun by the Poynting–Robertson effect in a time shorter than the expected collision time with Mercury (about 106 years). The proportion of fine grained to large-grained material ejected from such an impact is uncertain. Therefore, it is not known if a large impact at Mercury`s present distance could exclude enough mantle material to account for its large iron core. However, the disruption event need not have occurred at Mercury`s present distance from the Sun. It could have occurred at a much greater distance (e.g., >0.8 AU; Fig. 20). In this case the ejected mantle material would be mostly swept up by the larger terrestrial planets, particularly Earth and Venus. Mercury`s internal structure is unique in the solar system. It also imposes severe constraints on any proposed origin of the planet. Mercury`s mean density of 5440 kg/m3 is only slightly less than Earth`s (5520 kg/m3) and larger than Venus` (5250 kg/m3). Because of Earth`s large internal pressures, however, its uncompressed density is only 4400 kg/m3 compared to Mercury`s uncompressed density of 5300 kg/m3. This means that Mercury contains a much larger fraction of iron than any other planet or satellite in the solar system (Figs. 3 and 4). If this iron is concentrated in a core, then the core must be about 75% of the planet diameter, or some 42% of its volume. Thus, its silicate mantle and crust is only about 600 km thick. For comparison, Earth`s iron core is only 54% of its diameter, or just 16% of its volume. Aside from Earth, Mercury is the only other terrestrial planet with a significant magnetic field. Mariner 10 first encountered Mercury`s magnetosphere at a distance of 1.9 radii from its surface. It took measurements of the field for only 30 minutes; ∼17 minutes during Mercury`s first equatorial pass, and ∼13 minutes during the third high latitude pass. These short observations are all we know about Mercury`s magnetic field, magnetosphere, and particle environment. However, investigators constructed a picture of the magnetic field environment at Mercury based on analogy with that of Earth`s magnetic field and particle environment. Because Mercury probably lacks the ionosphere and trapped radiation zones of Earth`s magnetosphere, many comparisons are inappropriate. The measured magnetic field is strong enough to hold off the solar wind and form a bow shock. As the spacecraft approached the planet, it measured a sudden increase in the field strength that represented the bow shock. Also the instruments measured signals indicating the entrance to and exit from a magnetopause surrounding a magnetospheric cavity about 20 times smaller than the Earth`s (Fig. 5). Also because of the small size of Mercury`s magnetosphere, magnetic events happen more rapidly and repeat more often than in Earth`s magnetosphere. The nominal magnetopause subsolar distance is estimated to be about 1.35 ± 0.2 Mercury radii, and the bow shock distance is about 1.9 ± 0.2 Mercury radii. The polarity of the field is the same as Earth`s. The magnetic strength increased as the spacecraft approached the planet. The interplanetary field is about 25 nT (nano-Tesla) in the vicinity of Mercury, but it increased to 100 nT at closest approach to Mercury. If that rate of increase continued to the surface, the surface strength would be about 200 – 500 nT. This is about 1% of the Earth`s strength. Although other models may be possible, the maintenance of terrestrial planet magnetic fields is thought to require an electrically conducting fluid outer core surrounding a solid inner core. Therefore, Mercury`s dipole magneticfield is taken as evidence that Mercury currently has a fluid outer core of unknown thickness. Recent high-resolution radar measurements of the magnitude of Mercury`s librations indicate that the mantle is detached from the core confirming the outer core is fluid. Although the thickness of the outer fluid core is unknown at present, theoretical studies indicate that a dipole magnetic field can be generated and maintained even in a thin outer fluid core. Thermal history models strongly suggest that Mercury`s core would have solidified long ago unless there was some way of maintaining high core temperatures throughout geologic history. Most theoretical studies consider the addition of a light, alloying element to be the most likely cause of a currently molten outer core. Although oxygen is such an element, it is not sufficiently soluble in iron at Mercury`s low internal pressures. Metallic silicon has also been suggested, but sulfur is considered to be the most likely candidate. Some models require only a small amount of sulfur, whereas others support greater amounts. Currently we do not know how much sulfur is in the core, but it is possible that the MESSENGER mission will provide the answer. If sulfur is the cause of Mercury`s outer fluid core, then estimates of its abundance can be used to estimate the thickness of the outer fluid core. For a sulfur abundance in the core of less than 0.2%, the entire core should be solidified at the present time, and for an abundance of 7% the core should be entirely fluid at present. Therefore, if sulfur is the alloying element, then Mercury could contain between 0.2 and 7% sulfur in its core. As discussed later, possible sulfur abundances can be estimated from the planetary radius decrease derived from the tectonic framework. Mercury is the least known of all the terrestrial planets, but it is probably the only planet that holds the key to understanding details of the origin and evolution of all these bodies. Because only half of the planet has been imaged at relatively low resolution, and because of the poor characterization of its magnetic field and almost complete ignorance of its silicate composition and variation across the surface, there is little hope of deciding between competing hypotheses of its origin and evolution until more detailed information is obtained. Fortunately, help in on the way. The spacecraft MESSENGER is now on its way to orbit Mercury. This mission is one of NASA`s Discovery series of planetary exploration missions. MESSENGER is managed by the Applied Physics Laboratory of Johns Hopkins University in Maryland, and the Carnegie Institution of Washington, D.C.
On August 3, 2004, the MESSENGER spacecraft was launched from Cape Canaveral, Florida, to explore Mercury for the first time in over 30 years (Fig. 23). After the Earth flyby that took place in August 2005, it took two flybys of Venus (October 2006 and June 2007) and three flybys of Mercury (January and October 2008, and September 2009) before it was inserted into Mercury orbit in March 2011. It took 7 years to put the spacecraft in orbit around Mercury because the spacecraft must make six planetary encounters to slow it enough to put it in orbit with a conventional retro rocket. A direct flight to Mercury would get the spacecraft there in about 4 months, just like Mariner 10. However, it would be traveling at such a high speed at Mercury encounter that it would take the equivalent of a launch rocket to put it in orbit. That is the reason Mariner 10 could not be captured into orbit around Mercury. There are seven main objectives of the mission, all of which are important to understanding the origin and evolution of Mercury and the inner planets. One is to determine the nature of the polar deposits including their composition. Another objective is to determine the properties of Mercury`s core including its diameter and the thickness of its outer fluid core. This is accomplished by accurately measuring Mercury`s libration amplitude from the laser altimeter and radio science experiments. A third objective is to determine variations in the structure of the lithosphere and whether or not convection is currently taking place. A fourth objective is to determine the nature of the mag netic field and to confirm whether it is a dipole. There are several instruments to study the chemical and mineralogical composition of the crust that should place constraints on Mercury`s origin and, we hope, help us decide among the three competing hypotheses. Also these data will be extremely useful to help us decipher Mercury`s geology. The geologic evolution of Mercury will be addressed by the dual camera system that will image the entire surface at high resolution and at a variety of wavelengths. Finally, the exosphere will be studied to determine its composition and how it interacts with the magnetosphere and surface. There are eight science experiments on board the spacecraft (Fig. 24). a radio science experiment that uses the telecommunication system. These instruments will be used to accomplish the objectives discussed previously. They are listed in Table 2 together with the measurements they will make. MESSENGER will be placed in an elliptical orbit with a 200-km periapse altitude located at about 60◦N latitude (Fig. 25). The orbit has a 12-hour period when data will be collected and read out. The spacecraft will also collect valuable data on its three flybys of Mercury prior to orbit insertion. MESSENGER should provide the data necessary to answer most of the questions raised in this chapter. The Europeans are also planning a Mercury mission called BepiColombo in the years immediately following the MESSENGER investigations.